We all love anything new and fancy, don't we? It's primarily why Filipinos quickly fall in love and in line for new restaurant franchises especially if from overseas. We're eager to say, "I have been there!" way before others could even plan going. Having said that, it is in search for something new and fancy that I came about Cookie Mug. How about a mug you can drink from and eat after? 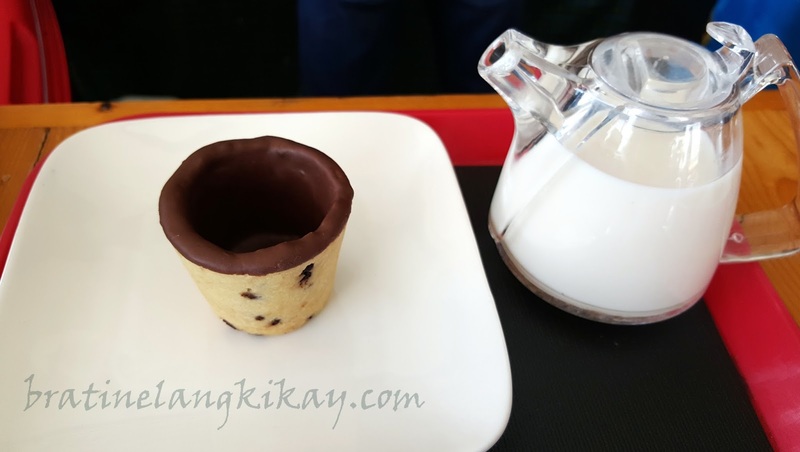 Cookie Mug is a small coffee and cake shop along Lilac Street in Concepcion, Marikina and from the name of the shop, one can tell what is the specialty. They serve cold milk, mocha, caramel milk or chocolate milk in a mug-shaped cookie called Cookie Shots. Cookie Shots come in three sizes: Small (Php48 each), Medium (Php78 each) and Large (Php108 each). Add from Php20 to Php60 pesos for the milk (or other milk variants) you will drink from the cookie mug. 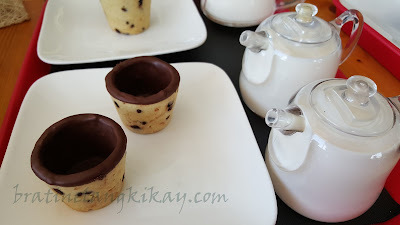 Personally, the cookie shots taste fairly average although I was quite amazed the cookie doesn't crumble or turn soft even after pouring milk half a dozen times. My kids disagree with me, of course, as they devoured the cookie mug even before they were able to drink half their milk. Hence, I had to buy them additional cookie shots. The cafe serves milk tea, specialty coffee and other cakes and pastries. It can get a bit crowded as the store itself can only sit about 10 people. Take out is an option although to have the best cookie mug experience, one must dine in. Opens at 1pm and closes by 11pm.